One of the nicer temples in the Tokyo area is the one in Kawasaki City. It may not be as big and famous as the one at Sensoji, but it’s worth a stop if you’re looking for things to see in Tokyo. 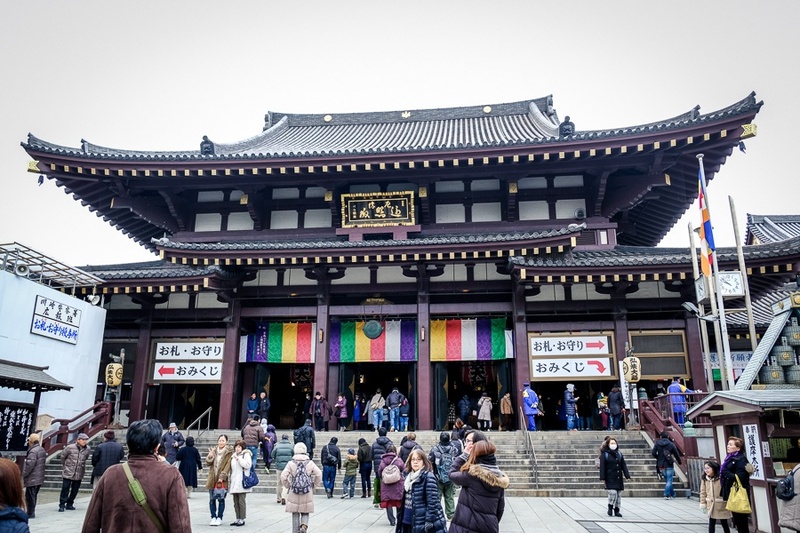 Kawasaki Daishi Temple was originally built in the 1100s, but it was mostly destroyed in World War II. Even though the current building is a reconstruction, it’s still pretty impressive and looks authentic. The approach to the temple takes you through a narrow street lined with dozens of cool shops selling souvenirs and food. At the end of the street you’re greeted by the huge main temple hall, along with a big 5 story pagoda and gate. In some ways this temple is like a smaller version of the big one at Sensoji, but the buildings look a bit different too. The temple is located in Kawasaki City, just south of Tokyo, or 4.5 miles (7.5 km) from Haneda Airport. It’s pretty easy to reach via Japan’s rail network. Kawasaki-Daishi Station is just a 5-10 minute walk from the temple.